So, you’ve had a baby. Now you want to go on holiday but you’re a little bit terrified. There is a plethora of advice on the Internet about holidaying with babies and children. Lots of sites offer long lists of what to take and suggest luxury hotels which offer everything from babysitting to baby concierge. I thought I’d try adding my two pence worth if only because a) I’ve travelled with a little baby and b) in my previous job as a travel agent I booked lots of family holidays. I’m not trying to sell anything to anyone so I hope I can offer some impartial advice to any would-be new travelling families. We took a holiday with our first child when he was six weeks old so I’m talking here about holidays with young babies rather than infants on the move (which is a totally different type of “holiday”). I’m also referring to the type of trip which involves using a passport. First things first, if you have a healthy baby who’s gaining weight and feeding well, now is a brilliant time to take a holiday. Your baby should be sleeping a lot (during the day…) which means the flight shouldn’t be too much of an issue and it also means you should be able to enjoy plenty of “down time”, something you’ll get little of once your child learns to move. If you take a holiday now you’ll look back on it wistfully in a few years time as that last holiday which was more about what you wanted than what your children wanted. You really don’t need to take too much stuff with you when you’re travelling with an infant. Young babies feed, sleep and poo so provided you have these things covered everything else should be pretty straight forward. If you’re breastfeeding you have very little paraphernalia to pack but even with bottle feeding you just need a few bottles, milk powder, access to a sterilising vessel at your destination (a saucepan if you’re self catering) and some packets of Milton. The big brands like Pampers have conquered most of the world so things like nappies and wipes can all be sourced locally. Indeed, unless you’re going somewhere very unusual you’ll find other countries stock pretty much everything you need given that mothers and babies exist all over the world. Any major essentials should go in your carry-on bag (which is a very generous allowance these days) to avoid that terrifying scenario of lost luggage, otherwise just pack enough for your first few days. Babies need a few changes of clothes and a few little toys but generally they’re pretty self-sufficient as they only really want to gaze at their mother for the first few months. 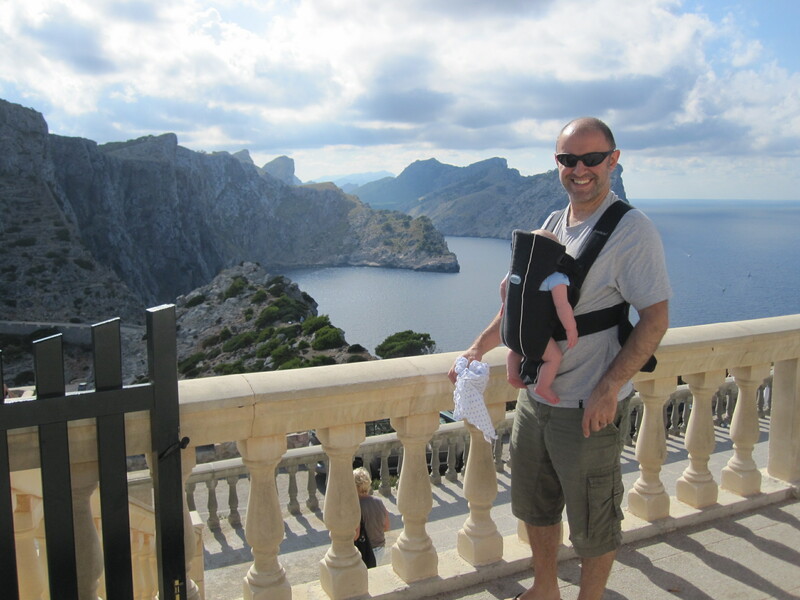 We took our six week old to Mallorca. We booked the flights and a villa the week before (once we’d secured his Winston Churchill lookalike passport photo) as it was the end of September and there were some great deals to be had. Although our son was rather unsettled during his first few months of life with colicky evenings, we decided jetting off for a bit of last minute sun before autumn set in would be a great little adventure. We flew with easyJet; the staff were charming and pretty much everyone on the flight had babies or children so the atmosphere was very relaxed (for parents that is, less so for those without offspring). We had a great week of long lunches in the sunshine, drives through the Tramontana Mountains and a few trips to the beach. When you’re considering destinations for your first family trip abroad, there are two options. You could opt for a final “grown up” destination such as a gastronomic city like Lyon or Bologna, armed with the knowledge this might be the last such trip you take for a while or do what we did and go to a typical child-friendly destination. I’d never been to Mallorca before but I will definitely be going back as it is truly fantastic for families. Distances are short, beaches are plentiful, restaurants are generally baby-friendly (plenty of baby changing facilities in toilets for example) and it’s only two hours from the UK (and accessed from most of our regional airports). Our villa was just outside Pollenca, near to Alcudia which has a beach with very firm sand which we could wheel our pram onto, not something we’d considered useful before. Everyone goes on about Italy being perfect for family holidays because of the nation’s love of children but Spain is on a par I’d say, as is every European country I’ve taken my children to. In fact, unless you’re visiting that make believe place from Chitty Chitty Bang Bang, you and your baby should be welcome everywhere. Even the UK isn’t as bad as we all like to make out, we’ve had plenty of friendly and kind attention bestowed on us during our travels through Britain. Child-hating England is a myth I’m keen to dispel. Once you’ve chosen your destination, the next decision is the accommodation. Unless you have piles of cash or you want to be stuck in one room with your baby all evening there’s really no need to stay in a hotel. There are some fantastic villas to be had outside the school holidays which give you space to unwind and peace of mind that your little angel isn’t waking those in the room next to you at 2am (believe me, if you’re in a hotel he will be). Our son was quite noisy for several hours in the evening and it was great having a large villa (booked through the excellent Vintage Travel) to pace about in while we endeavoured to settle him. If you’re opting for a city break, there are plenty of brilliant rental apartments these days accessed through Airbandb and such like. The only word of caution here is that you ensure the agent or owner does adhere to your baby-related requests. We took our son to Lisbon when he was 18 months and used a small rental agency who found us a great little flat in the city centre. However, the rather laid back property owner claimed no knowledge of our request for a cot. Fortunately the agency owner sourced one for us from another apartment. In terms of flying, I found that feeding my son while the plane was taxiing along the runway worked a treat. He didn’t notice any change in cabin pressure and slept most of the way in each direction, the benefit of travelling with a newborn baby. In fact, if you’re considering flying further afield, perhaps to visit friends or family on the other side of the world, now is the time to do it. Small babies can be accommodated in bassinets, provided you book this in advance. Once your baby starts to crawl, or worse, walk, and doesn’t sleep on demand, flying further than the Med will be a less appealing prospect. Something you’re unlikely to fully appreciate until it’s too late is that holidays now are no longer about you (although they are great in a totally new way). However, this holiday with your tiny baby is almost still your holiday rather than his. He will sleep a lot so enjoy those uninterrupted lunches and lounges. He won’t complain about boring car journeys so relish any scenic drives you happen upon. So, go on holiday, put your feet up and make the most of it, you might not get the opportunity again for many years. Read about our thoughts on travelling with a toddler and our tips on road trips with kids. Let me know in the comments below how you got on taking a holiday with a new baby.